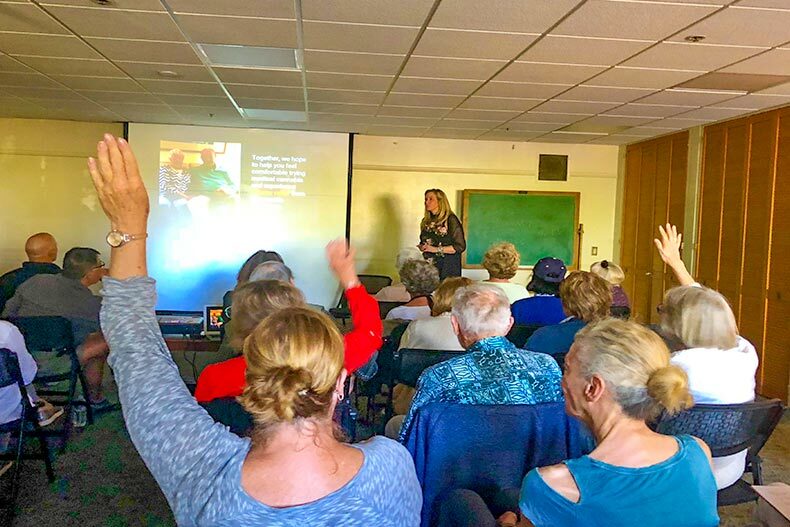 A presentation at Trilogy at the Vineyards on different types of cannabis products from Octavia Wellness. Whatever your stance on it, there’s no denying that legalized marijuana is becoming the norm across the U.S. It is currently legal to use cannabis recreationally in ten states (Alaska, California, Colorado, Maine, Massachusetts, Michigan, Nevada, Oregon, Vermont, and Washington) as well as Washington, D.C. It’s legal to sell marijuana in retail stores in each of those places except for Vermont and D.C.
Cannabis is also decriminalized in 14 more states, including Arizona, Florida, Illinois, and New Jersey. Specifics vary from state to state, but it usually means that medical marijuana is allowed in some form but the recreational version is not. In some cases, these states have also lessened punishments for possession. A state-by-state breakdown of marijuana laws. 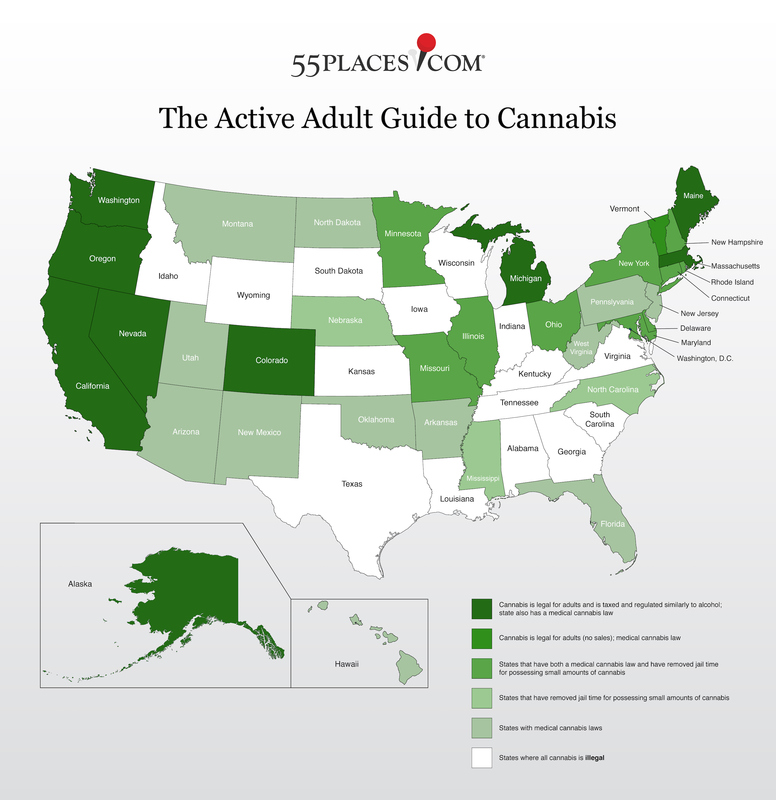 For active adults living in these states, these changes can open up whole new possibilities. Medical marijuana has been a boon for seniors looking for alternative pain medication and many studies have shown overwhelmingly positive effects. It’s no surprise to learn that seniors are the fastest-growing population of new cannabis users in America as more of them turn to it, whether to improve health or their well-being. For many, however, the whole topic of marijuana still feels a little sticky. After having lived in a world where it was illegal for so long, it can be a bit daunting to suddenly walk into a store, know what you’re looking for, and buy it without looking over your shoulder. Let’s try to demystify marijuana and make it easier for active adults to make the right choice for themselves. One of the first questions you might have is what the difference is between marijuana, hemp, and cannabis? While you’ll see these words used often, they are usually describing the same thing. That said, there are plenty of people out there willing to argue over semantics, especially if you compare the scientific and legal definitions. Cannabis is the scientific name of the plant from which all of the products you buy are derived. Within the Cannabis family of plants are a few different types of plants, one of which includes psychoactive substances (usually referred to as lowercase cannabis) and one of which does not (usually referred to as hemp). Whereas the former is used to create psychoactive products, such as recreational drugs and oils, the latter is used as a textile. Marijuana, meanwhile, is simply a nickname of Mexican origin given to the cannabis plant and its flowers. Under U.S. law, however, cannabis is the plant while hemp and marijuana describe specific parts of the plant. Hemp usually refers to sterilized seeds, stalks, and roots while marijuana refers to seeds, leaves, and flowers that contain psychoactive substances. Long story short, if you’re going to buy a recreational product, you can’t really go wrong referring to it as cannabis or marijuana. What Are the Health Benefits? After years of misinformation and confusion, people are starting to realize that there are lots of health benefits to cannabis, which has been used medicinally for thousands of years. While there are pros and cons to all medical treatments, cannabis can offer help to those suffering from any number of ailments, including anxiety, insomnia, nausea, migraine headaches, glaucoma, and chronic pain. It has even been used as part of treatment plans for those suffering from Parkinson’s and Alzheimer’s. There are still plenty of debates being held about the effectiveness of cannabis for specific ailments, as well as levels of addictiveness. A 2016 study in Health Affairs noted that painkiller prescriptions went down in states where residents had access to cannabis and many see it as a better alternative to opioids. What Kinds of Products Can I Buy? There used to be a time when the only way to use marijuana would be in the form of a joint. Those days are long gone as recreational usage has opened the floodgates to new products and unique ideas to make cannabis as customer-friendly as possible. In fact, there are four basic types of products you’ll be able to buy in the neighborhood cannabis shop. The most recognizable way to use cannabis is to inhale it by smoking. You can buy loose cannabis flowers or hash if you want but dispensaries offer pre-rolled joints as well. Vaping (e-cigarettes) has gained popularity in recent years as an alternative for smokers but it also works for cannabis. The vapor that a vape pen produces is gentler on the lungs than if smoked. Ingesting cannabis in this method means you’ll feel the effects quickly and is a good option if you are experiencing nausea. You don’t need to inhale cannabis to enjoy its effects. Instead, you apply it directly to your skin in the form of a cream, balm, or spray. Topical usage is a great way to treat localized pain, eczema, and burns because it offers all of the soothing benefits without any side effects. Not only do topicals start working quickly and last for up to four hours but you can continue to apply since there is no psychoactive effect. “You don’t have to get high to experience the benefits of cannabis,” according to Annie Franklin of Octavia Wellness, which specifically gears its line of products towards seniors and their needs. Cannabis extracts are often blended with oils or alcohol bases to create tinctures that you can take orally. This eliminates concerns over the bad smells and smoke often associated with marijuana. This version of cannabis is good for treating chronic pain or insomnia and works best when placed under the tongue in order to be absorbed. This version takes effect quickly and lasts for two-to-four hours. You’ve probably heard of pot brownies but those are just the tip of the iceberg when it comes to cannabis-infused edible items. These days you’ll find edibles of all kinds, from chocolates to cakes to gummies. It’s a great option for those who don’t want to smoke but want to use the product in a way that lasts long. It’s important to read product labels, understand the dosages, and ask for advice if you’re trying edibles for the first time. Effects can last anywhere from three to six hours depending on all of the ingredients. Your local dispensary will have plenty of cannabis products to try. Once you’ve decided to give cannabis a try, it might feel overwhelming to try to figure out where to go to get it. The good news is that there are plenty of options in states where recreational cannabis is legal. Given the booming popularity of recreational marijuana in states where it’s legal, there is probably a dispensary located within driving distance to you. These aren’t fly-by-night operations, either. These are licensed and regulated stores full of well-sourced products. 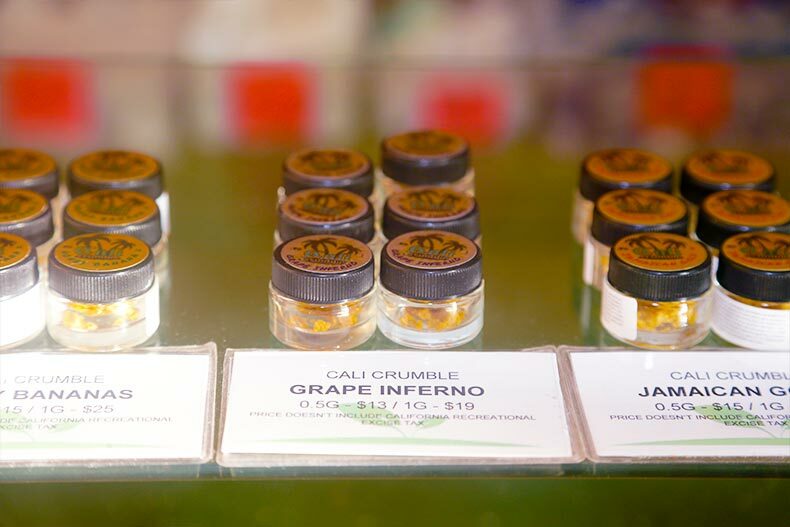 You can even shop around to see which dispensary you like best. You want to find one with a knowledgeable staff, good product selection, and a friendly atmosphere. Local marijuana delivery is still something of a grey area (although that is changing in some states). But if you plan ahead, you can order cannabis products for delivery from companies such as Octavia Wellness in California or Stratos in Colorado. These companies offer full lines of products that can be sent directly to your doorstep. Because of the current laws, you’ll only be able to receive delivery from a company that resides in the same state as you. You’ll also likely need a prescription for medical marijuana. What Are My Community Rules? It might be legal to use recreational or medical cannabis in your state, but that doesn’t necessarily mean it’s okay to use it in your active adult community. 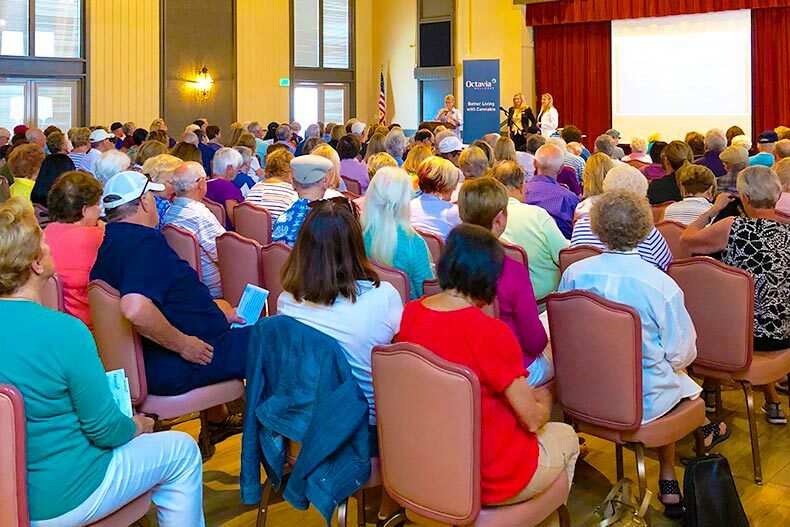 Just like with tobacco and alcohol, each community can have their own specific rules about what residents are allowed to do, where it can be stored, and what versions of the product can be used. The easiest way to find out what your community rules are is to ask. Get a copy of the homeowner’s association bylaws. If there’s nothing in there about cannabis use, or if the rules are hazy regarding oils or edibles, perhaps it's something that needs to be addressed at a board meeting.